Thailand’s Nok Air plans to pursue fleet and network expansion as it seeks to raise about USD100 million through an initial public offering (IPO). The planned 3Q2013 IPO is one of several milestones for Nok in 2013 as the low-cost carrier resumes international services, initially with flights to Yangon and Mawlamyine in Myanmar. Nok will also take delivery of additional 737-800s, completing in 2013 the phase-out of its 737-400 fleet, which it has been operating since launching services in 2004. Nok, which is partially owned by Thai Airways, has traditionally been a relatively conservative and low profile carrier. It has not been shy to contract during challenging periods and has never been concerned about establishing an international profile, instead focusing on building a strong local brand in the Thai market. But Nok’s steady profitability and strong position in a growth market should allow for a successful IPO and could eventually lead to significant international expansion. Nok currently serves over 20 domestic destinations but has not operated scheduled international services since 2008, when short-lived services to Bangalore in India and Hanoi in Vietnam were discontinued. Nok has been preparing for a resumption of scheduled international services since early 2012, believing its more efficient fleet of newly acquired 737-800s are a better fit for international operations. Nok has been testing the waters with international operations since Mar-2012, when it began using its 737-800s to operate charters to China. But this operation is limited to only three weekly flights, giving Nok a very small presence in a huge market. In 2012 China overtook Malaysia as Thailand’s biggest source of visitor arrivals with 2.5 million visitors. Several charter and scheduled carriers from both countries have been rapidly adding capacity to meet fast-growing demand in the Thailand-China market. But Nok has no short-term ambitions to expand into scheduled flights in the Thailand-China market. Instead the carrier is targeting Myanmar as the first and only country it will add to its network in 2013 as part of the initial phase of a relatively slow-paced international expansion plan. Nok CEO Patee Sarasin tells CAPA that the carrier is preparing to launch two services to Myanmar and will then take a hiatus in expanding its international network until 2014. “We don’t want to spread our wings into different countries simultaneously ... we want to make sure each destination we add is successful,” he says. A daily 737-800 service will be launched in the Bangkok-Yangon market in “about the third quarter”. Mr Sarasin says Nok will also launch by Aug-2013 a daily service from Mae Sot in northwest Thailand to Mawlamyine in nearby southeast Myanmar, using Saab 340 turboprops that are operated by another Thai carrier under the Nok Mini brand. Myanmar is a logical initial destination for Nok as, unlike nearly every other major international market from Thailand, the Thailand-Myanmar market predominately consists of outbound Thai traffic. This significantly mitigates Nok’s risk as Nok is able to leverage its strong domestic brand and local distribution network. Nok has a strong following among Thais, particularly Thailand’s younger population. Nok has been able to build up a larger domestic network than its rival Thai AirAsia, which until now has focused more on leveraging the stronger international brand of AirAsia by focusing on the international market and domestic routes which attract a large portion of foreigners. Nok will compete against Thai AirAsia between Bangkok and Yangon. But this is a large and fast-growing market, experiencing a 32% increase in capacity over the last year to about 14,800 weekly one-way seats as all three Thai carriers on the route have added capacity in response to growing demand. Thai Airways now has a leading 41% share of capacity on Bangkok-Yangon (includes both Bangkok airports), compared to 26% for Thai AirAsia and 18% for Bangkok Airways. Myanmar Airways International (MAI) also serves the market with two daily flights, giving it a 15% share of capacity. Note: *includes both Bangkok airports. Nok is confident continued growth in the Bangkok-Yangon market can support a new entrant, particularly by the next high season, which in Myanmar runs from about October to March. Nok’s single daily flight will give it about an 8% share of the market, a modest amount which is relatively small given the overall growth seen in the market over the last year. While the 32% capacity increase already seen in the Bangkok-Yangon market seems large, it has come as Myanmar’s market has exploded. Overall international capacity has increased by about 64% since Aung San Suu Kyi’s National League for Democracy won landmark elections in Apr-2012. That would suggest there is room for further growth to Bangkok, which is the biggest international destination from Myanmar. Eight new carriers have launched service to Myanmar since Sep-2012, giving the country service from 22 foreign carriers. Nok will be the 24th foreign carrier in the Myanmar market, following the 31-Mar-2013 launch of service by sister carrier Thai Smile on the Bangkok-Mandalay route. Mr Patee says Nok is not currently interested in serving Mandalay, which is Myanmar’s second largest city and the country’s most famous tourist destination, alongside Thai Smile. Bangkok-Mandalay is seeing a bigger influx of capacity in 2013 than the core Bangkok-Yangon route. In addition to Thai Smile, MAI is resuming services between Bangkok and Mandalay on 31-Mar-2013 while Bangkok Airways has unveiled plans to launch the route on 16-Sep-2013. Thai AirAsia launched service to Mandalay in Oct-2012. Nok instead sees a potential niche in Mawlamyine, which is Myanmar’s fourth largest city after Yangon, Mandalay and the new capital Naypyidaw. Mawlamyine is the capital of Mon Stat state, which is located southeast of Yangon and near the border with Thailand. Mae Sot is the closest city in Thailand and is only about 100km away by air. But to drive between Mae Sot and Mawlamyine takes several hours as the road is circuitous and rough. As it is such a short flight, and as Nok is able to use the Saab 340 fleet operated by Siam General Aviation, the risk in entering the Mae Sot-Mawlamyine market is low. Nok already uses Saab 340s to serve Mae Sot from Bangkok and Chang Mai, the largest city in northern Thailand. As a result Nok can provide connections to Mawlamyine from both its two largest bases and simply extend an existing Nok Mini Mae Sot flight to include an additional very short sector to Mawlamyine. The Mawlamyine airport is currently only served by domestic carriers. Technically only three of Myanmar’s airports are open to international services – Mandalay, Yangon and Naypyidaw, where an international airport opened in late 2011 but so far has seen only very limited domestic services due to a lack of demand. Nok has received special clearance from Myanmar authorities to operate the first international flights at Mawlamyine. The Nok Mini operation currently consists of three 34-seat Saab 340s serving about 10 domestic routes. Nok also serves regional destinations with its own fleet of 66-seat ATR 72s. The carrier currently operates three ATR 72s and is now looking to add a fourth aircraft in 2013. The ATR 72s will be retained and used to serve destinations that are too small for 737-800s. Nok’s initial fleet of two ATR 72s were initially inherited from Thai Airways International as Nok was forced to take over routes within northern Thailand that were formerly operated by its part parent. While Nok’s otherwise independent management team was not keen on turboprops initially they discovered the ATR 72s was useful in opening new markets. Nok subsequently decided to further expand its regional network by adding the Nok Mini operation, which initially consisted of Cessna Caravans. As demand has grown rapidly in the regional markets, several routes have been upgraded from Caravans to Saab 340s, from Saab 340s to ATR 72s and from ATR 72s to 737s. Nok offers connections including baggage transfer at Chiang Mai, where regional flights within northern Thailand are operated. Nok is also now looking at the logistics of introducing a transfer service at its main Don Muang hub, which would help it generate traffic on its new international network. The regional operation has become an important component to Nok’s hybrid model and allowed Nok to establish the biggest domestic network in Thailand. Nok is also not a pure LCC in that it provides some frills such as complimentary checked bags and snacks (but drinks including water have to be purchased). Nok also has always offered a premium cabin on its 737-400s, which are configured with 150 seats in two classes. The Nok Plus product, which includes complimentary drinks and a higher baggage allowance along with the bigger seat, was initially drummed up as a necessity rather than from an intentional hybrid strategy because Nok inherited its 737-400s from Thai Airways and did not want to invest in retrofits. Given the limited demand for premium services on its existing domestic network Nok opted to go with 189-seat single class configuration for its 737-800s when it started the process of renewing its fleet in late 2011. It has since taken nine 737-800s from lessors. The first seven were second-hand aircraft while its last two, which were received in early Feb-2013, were taken as new aircraft from leasing companies. This marked the first time in Nok’s history that it has operated a brand new aircraft, marking another milestone for the nine-year old carrier. Mr Patee says Nok’s remaining three 737-400s will be phased out by the end of Mar-2013. Currently the remaining 737-400s are being used as spares and to operate a small number of frequencies in some markets. Nok is committed to leasing four more 737-800s in 2013, giving it a year-end fleet of 13 aircraft. The additional 737-800s will be used to further expand domestic capacity as well as support the launch of services to Yangon. Mr Patee says Nok plans to add more 737-800s in 2014 with some of the additional aircraft being configured with two classes. While the Nok Plus product will be phased out when the last 737-400 is returned Nok has determined it should have two cabins for longer international flights, where there is higher demand and higher yields for a premium product. The initial fleet of 737-800s in single class configuration will be used for short-haul international flights, including the potential resumption of flights to Vietnam in 2014, while the two-class aircraft will be used for medium-haul flights such as mainland China and Hong Kong. Mr Patee says Nok is now evaluating several potential markets for its two-class 737-800s. Vietnam will most likely be Nok’s second destination after Myanmar but Vietnam could be served with the existing single-class 737-800s. Over the last year the transition from 737-400s to 737-800s has resulted in a large increase in domestic capacity for Nok. According to CAPA and Innovata data, Nok’s domestic capacity has nearly tripled from about 43,000 weekly seats in Oct-2011 (before the Bangkok floods, which led to a temporary cuts in frequencies just as the first 737-800s were delivered) to over 125,000 weekly seats currently. Nok currently accounts for over 25% of capacity in Thailand’s domestic market compared to only about 12% in Oct-2011. Thai AirAsia currently accounts for a market leading 30% share of capacity in Thailand’s domestic market, slightly ahead of the 29% share it had in Oct-2010. Thai Airways has seen its capacity share slip from 40% to 26% over this period (includes capacity from Thai Smile) while full-service boutique carrier Bangkok Airways has maintained its capacity share at 16%. Nok has steadily added capacity since Don Muang reopened in Mar-2012, after the airport was shut for over four months due to flooding. (Nok had to move its base to Suvarnabhumi from late Oct-2011 to early Mar-2012 but was unable to operate its full schedule at Suvarnabhumi due to congestion and a lack of parking spots.) Nok’s latest capacity increase came in late 2012, when the carrier added flights on several of its biggest routes in time for Thailand’s peak season. For example Bangkok-Chiang Mai, Nok’s largest route, increased in Dec-2012 from six to nine daily flights and Bangkok Hat Yai, its second largest route, increased from five to seven daily flights. (Chiang Mai is now served with 50 weekly frequencies in each direction and Hat Yai with 46 weekly frequencies in each direction, according to Innovata data.) At the same time, Bangkok to Udon Thani and Nakhon increased from four to five daily flights while Bangkok to Phuket, Surat Thani and Ubon Ratchathani increased from three to four daily flights. Nok currently accounts for about 32% of total capacity from Don Muang, compared to 66% for the AirAsia Group (includes 59% for Thai AirAsia). In the domestic market from Don Muang, Nok currently has about a 45% share of capacity compared to 51% for Thai AirAsia and 4% for Orient Thai Airways. Don Muang, which is Bangkok’s old international airport, reopened to international services in 2012. The airport has generally remained open for domestic services since Suvarnabhumi opened in 2006. Nok has maintained its hub at Don Muang whenever possible although it was forced to have its original international operation in 2007 and 2008 at Suvarnabhumi and was forced to also operate domestic services at the new airport on a couple of occasions, including when Don Muang was closed due to floods in late 2011 and early 2012. Thai AirAsia, along with sister carriers AirAsia Malaysia and Indonesia AirAsia, moved its entire Bangkok operation from Suvarnabhumi to Don Muang on 01-Oct-2012. The move gave Nok, which over the years has touted the advantages of operating out of less congested Don Muang, more direct competition. But Nok claims not to have been impacted by Thai AirAsia’s move to Don Muang and says it has been able to maintain load factors near 90% even as it increased capacity on several of its routes. Thai AirAsia focuses on a slightly different segment of the market and has had a different network strategy, focusing more on international services. But there is obviously significant overlap on domestic routes. Thai AirAsia generally has higher frequency on domestic trunk routes but does not serve as many domestic destinations overall. For example, Thai AirAsia offers slightly more frequencies on Nok’s two largest domestic routes, Bangkok to Changi Mai and Hat Yai. Thai AirAsia also offers a significantly higher number of frequencies to the beach destinations of Phuket (nine compared to three for Nok) and Krabi (six compared to one for Nok). This reflects Thai AirAsia’s strong following among international passengers that hop around Thailand while on holiday. The smaller regional markets, many of which Thai AirAsia currently does not serve, have a different mix of passengers consisting almost entirely of Thais. Thai AirAsia currently serves 13 domestic and 19 international markets, according to Innovata data. 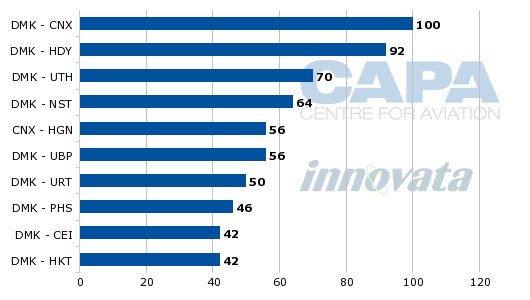 The carrier allocates 60% of its seat capacity and 43% of its ASKs to domestic routes. Competition between Thailand’s two main LCCs will further increase in 2013 as Thai AirAsia plans to add nine A320s, giving it a year-end fleet of 36 aircraft. Thai AirAsia plans to focus most of its additional capacity this year on the domestic market. This will likely result in new competition on domestic routes in which Nok is now the only LCC. Meanwhile, the two carriers will also start to compete in the international market, starting on the Bangkok-Yangon route, which is Thai AirAsia’s third largest international market after Singapore and Macau. Thailand has seen a rapid increase in LCC penetration rates over the last several years, driven by domestic expansion at Nok and Thai AirAsia and international expansion at Thai AirAsia. 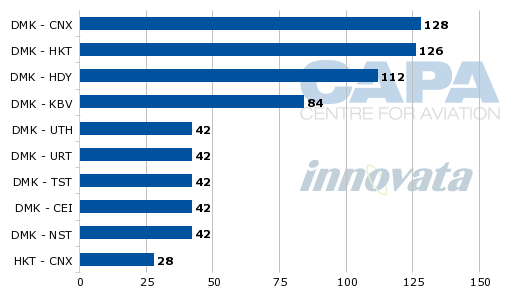 LCCs accounted for 51% of domestic and 16% of international seat capacity in 2012, according to OAG data. Thailand didn’t have any LCC capacity until 2004, when both Thai AirAsia and Nok launched services. LCCs accounted for 24% of the Bangkok passenger market in the fiscal year ending 30-Sep-2012, according to Airports of Thailand (AoT) data. For the same period LCCs serving Bangkok (both airports) recorded 17% passenger growth to 13.1 million while full-service carriers only grew traffic by 3% to 42 million. In the year ending 30-Sep-2012, Thai AirAsia transported 12.2% of total passengers at Suvarnabhumi, according to AoT data. Thai Airways accounted for a leading 36.3% share of passenger traffic while Bangkok Airways was the third largest carrier with 5.8%. Suvarnabhumi handled 52.4 million passengers in the year ending 30-Sep-2012, while Don Muang handled 2.7 million (almost all of this came from Nok during the slightly less than eight months Don Muang was open). 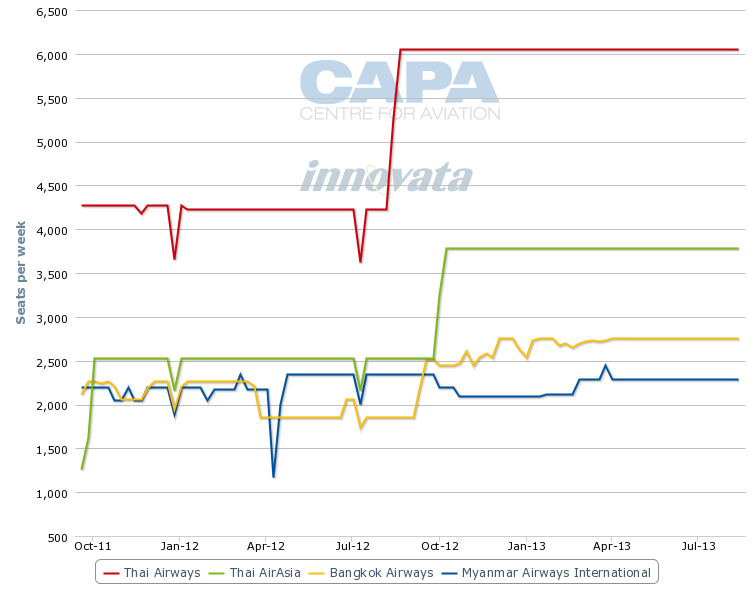 The Bangkok market will see further rapid increases in LCC penetration rates in 2013 driven once again by the continued expansion of Thai AirAsia and Nok. The further rapid expansion for Thai AirAsia comes after the carrier raised about THB4.5 billion (USD150 million) in a May-2012 IPO. Bangkok Airways is also now planning to join Nok in following Thai AirAsia with an IPO in 2013, giving the Stock Exchange of Thailand three new airline listings in a span of just over one year. Previously Thai Airways was the only publicly listed airline in Thailand. Mr Patee believes the stock market can absorb all three airline IPOs as each carrier focuses on a different segment of the market. General market conditions are also now favourable and Nok is not looking to raise a large amount of cash, making its IPO more feasable. Nok plans to raise only THB3 billion (USD100 millon). It is standing in a long queue of Thai companies looking to list and now expects to hold its IPO in Aug-2013. Nok began the pre-IPO process in Jan-2013, when it registered as a public company. It is now undergoing audits. The CEO says all existing shareholders expect to sell down as part of the IPO process as new shares are generated. Thai Airways now owns a 49% stake, having acquired an additional 10% stake from Krung Thai Bank in 2011. THB paid only THB165 million (USD5.5 million) for the additional stake, meaning Nok was valued at only TBH1.65 billion (USD55 million) in 2011. Based on the amount Nok expects to raise, the value would since have increased significantly, to approximately USD300 million. Nok’s management team now owns a 30% stake in the carrier. Siam Commercial Bank, which is also one of the original shareholders, owns 11% while the remaining 10% is spread across several small shareholders. If successful, the IPO will give Nok a total of THB5 billion (USD170 million) in cash, which it will use to help fund further fleet and network expansion. It already has about THB2 billion (USD70 million) in the bank, which has been mostly generated from profits. Nok launched services in 2004 with only THB500 million (USD17 million) in capital and the company has not required recapitalisation as it was almost immediately able to turn a profit – a remarkable achievement given the intense competition and challenging cycles of the airline industry. Nok has been profitable every year except 2007 and 2008, when the economic downturn forced it to slash capacity and return aircraft. Nok has since been back in the black the last four years. Nok recorded profits of THB504 million (USD17 million) in 2012, about double the TB250 million (USD8 million) profit from 2011, when a brutal fourth quarter caused by the Bangkok flooding wiped out what would have been a much more profitable year. Profits in 2012 were still down by about 16% compared to the THB600 million (USD20 million) profit from 2010. While Nok has been consistently profitable its outlook and potential for future growth for several years was impacted by questions about where – or if – the carrier fitted in Thai Airways’ often confused strategy. But 2012 finally brought clarity for Nok as Thai dropped plans to establish a separate LCC subsidiary for the international market. Meanwhile, the very hybrid Thai Smile has steadily moved up-market, taking on more a full-service regional carrier model similar to the model used by Singapore Airlines for SilkAir. As a result there is arguably limited overlap between Nok and Thai Smile, which originally was envisioned as a low-cost hybrid carrier. 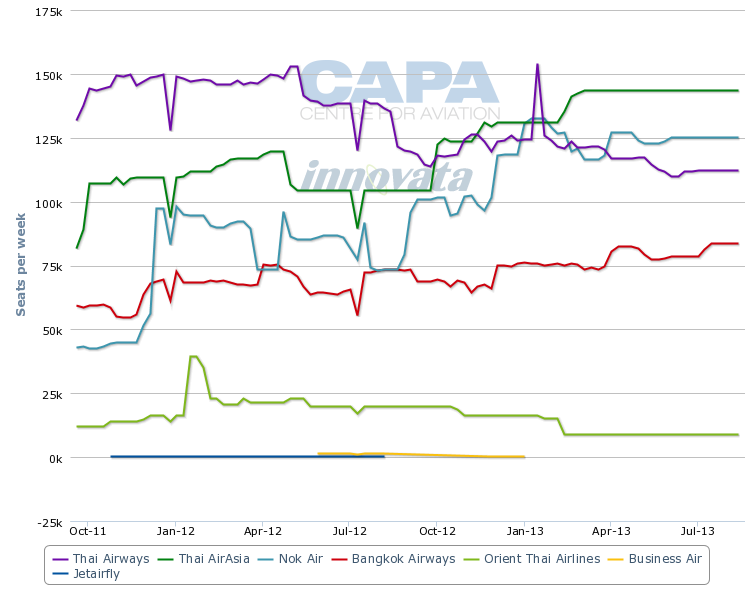 Nok’s positioning as Thai Airways’ only LCC brand significantly improves the carrier’s outlook. Not only will Nok continue to be used by Thai Airways to fend off domestic competition against Thai AirAsia, Nok is now the preferred option as Thai Airways tries to compete at the budget end of the international market. This will soon be applied to short-haul routes within Asia, where Thai AirAsia has emerged as a major competitor to Thai Airways, and later potentially medium/long-haul routes as Thai Airways considers its options for the emerging long-haul low-cost market. But Nok will face challenges as it starts to expand internationally. Unlike Thai Airways or AirAsia, Nok does not have a recognisable brand outside Thailand. Nok also lacks the scale to compete internationally with large LCC groups such as AirAsia. At is gradually expands internationally, Nok will also need to decide where to position its product. Offering some frills but charging for others, and offering a business class product on a small fraction of its fleet, could create confusion. Its product is well accepted in Thailand, where Nok had done a good job adapting to the local market. But the same product cannot be simply extended to Thailand’s international market, particularly as this market relies heavily on inbound traffic.